Pensioners in Italy will get free trips to the cinema if Silvio Berlusconi's party is returned to power, the former prime minister has reportedly said. Berlusconi, who is in hospital for an eye operation, has written a letter in which he sets out a host of promises to the elderly, as long as they vote for his Forza Italia party at the next election, Il Messaggero newspaper reports. As well as pledging to cut taxes and increase pensions, he says pensioners would get free cataract operations and dental implants, as well as "free cinema in the afternoons and train journeys during the week". The 78-year-old is currently banned from holding public office after being convicted of tax fraud, and has been doing community service at a care home as part of his sentence. "We say to our friends in retirement: Do not make the mistake that you made at the last European elections," he says in the letter. "You must go and vote. 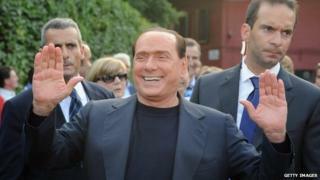 It's someone of your own age and who loves you who's telling you himself: Silvio Berlusconi." Forza Italia took a drubbing in the European Parliament elections in May, coming third behind Prime Minister Matteo Renzi's Democratic Party and the anti-establishment Five Star Movement. But Berlusconi, who famously owns two fluffy white poodles called Dudu and Dudina, has one final sweetener to persuade those older people who share his love of pets: "A free vet's appointment once a month for your four-legged friends".